This year, I’ve had the great pleasure and honor of getting to know Eva Lynd, one of the most multifaceted glamour girls of the 1950s and 1960s. Eva contacted me about six months ago, after I’d done a couple of posts about her here (“Eva Lynd vs. The Nazis…”). We’ve been corresponding on a regular basis ever since. I’ve learned from those conversations — and from photos Eva has emailed me from her personal collection — that her career as a model and actress was even more multifaceted than I knew when I wrote my initial posts about her. One facet that’s particularly intriguing for fans of men’s adventure magazines like me is her work as a model for artist Norm Eastman. 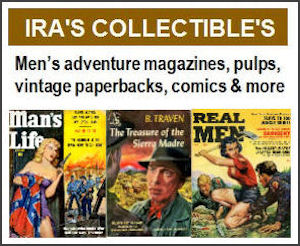 Eastman was one of the grandmasters of the men’s pulp mag artwork, particularly the wild cover paintings used by the “sweat magazine” subgenre. That’s the subgenre known for covers that show Nazis and other evil fiends distressing scantily-clad damsels in various ways. Eva “appeared” in many of the sweat mag cover paintings Norm created, like the one shown at the top of this post — the April 1967 issue of MAN'S BOOK. Nazis were the most common tormenters of Eva’s cover painting characters, since Eastman created many classic Nazi covers for the men’s pulp mags. In other Eastman cover scenes, Eva’s tormenters were evil Commies or bloodthirsty natives. Sometimes, she was a gun-toting, battling babe who was taking on the bad guys. Although most of Eva’s work as an artists’ model was for Eastman, she also modeled for some other great illustration artists in the ‘50s and ‘60s. And, Al Rossi used Eva as a model for a number of his men’s adventure magazine interior illos and pulp paperback cover paintings, some of which I’ve featured in previous posts. A while ago, Eva boggled my mind by emailing me scans of some reference photos Rossi took of her decades ago. In some, she is posing with the instantly-familiar male model Steve Holland, the favorite of many men’s adventure magazine and paperback cover artists in the ‘50s and ‘60s. Eva told me she modeled for illustration artists in New York during two periods when she lived there: 1956 to 1958 and 1964 to 1968. She thinks the Rossi photos are from the earlier period. 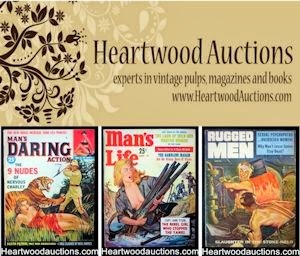 If anyone knows what magazine or paperback illos the photos above were used for, please shoot me an email or drop by the Men’s Adventure Magazines Facebook Group and let me know. Of course, the most widely-seen photos taken of Eva Lynd were pinup photos. In fact, glamour or “cheesecake” photographs and photo spreads featuring Eva appeared on the covers and inside pages of dozens of different men’s magazines published in the 1950s and 1960s. …and Earl Leaf, a photojournalist who became a popular pinup photographer and paparazzi, now best known for his photos of Marilyn Monroe. Other top photographers from those days who took photos of Eva included Wil Blanche, Herb Flatow, Leo Fuchs, Emil Herman, Morris Kaplan, Charles Kell, Lester Krauss, Ed Lettau and Jerry Yulesman. Naturally, most of the glamour photos of Eva were published by various types of men’s magazines, including DUDE, FOLLIES, GALA, JEM, MODERN MAN, NUGGET, TRUE ADVENTURE, MAN'S ACTION, ADVENTURE, PICTURE DIGEST, PICTURE SCOPE and REAL MEN. I’ve featured some of Eva’s glamour photos in previous posts on this blog, here and here. Below are are some I haven’t posted yet, from a hard-to-find magazine titled EARL WILSON’S ALBUM OF SHOWGIRLS, NUMBER ONE, published in 1956 by Skye Publishing Co., Inc.
Earl Wilson was a celebrity gossip journalist who was once fairly well-known for his syndicated newspaper column “It Happened Last Night.” As far as I know, issue Number One of his SHOWGIRLS publication was a one-off. It included photos and write-ups about dozens of popular and rising Hollywood actresses, pinup models and Burlesque Queens, including Marilyn Monroe, Jayne Mansfield, Mamie Van Doren, Kim Novak, Joan Collins, Sophia Loren, Rita Moreno, Anita Ekberg, Lili St. Cyr, Gypsy Rose Lee, and Evelyn "Treasure Chest" West. Given that list, it’s impressive that Eva was featured in a special two-page spread and centerfold. For some reason, Wilson misspelled Eva’s last name as “Lind.” But he was correct in identifying her as the daughter of a European Countess (Countess Margareta von Fielitz), and the rest of the text is quite a glowing promo for her. Around the same time, Eva began appearing in skits on popular comedy and variety television shows like THE STEVE ALLEN SHOW, THE GARRY MOORE SHOW and THE PERRY COMO SHOW, and on live specials like The Producer’s Showcase FESTIVAL OF MAGIC episode (hosted by Ernie Kovacs). This eventually lead to acting roles in dramas like THE THIN MAN and PETER GUNN. Before I started corresponding with Eva, I was aware of her work as an actress and as a model for artwork and photos that appeared in men’s adventure and pinup, or “girlie” magazines. But I was not aware of her work for some other magazine genres until she told me about it and emailed me scans of some examples. …and by women’s romance magazines like LIFE SECRETS and the aptly-named ROMANCE. In talking with Eva, I also learned two other facets of her career that I had been unaware of. In 1958, she performed as a casino showgirl in Havana, Cuba. She was also a popular (and often winning) beauty queen contestant. I’ll show some photos of those facets of Eva’s multifaceted career in the next post. Comments? Corrections? 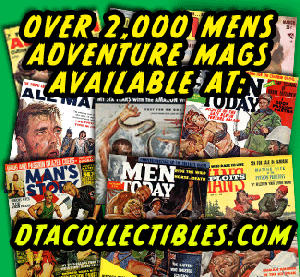 Post them on the Men’s Adventure Magazines Facebook Group. 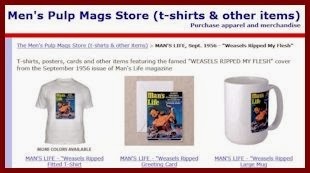 New in the MensPulpMags.com Virtual Newsstand! 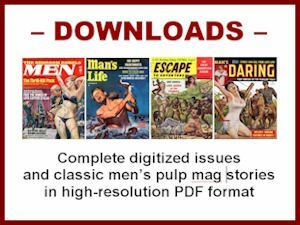 Featuring: a cover painting by Norm Eastman; wild adventure stories like “CAPTURE THE WILD RIDING RENEGADE NYMPH” (by pulp fan fave Dean W. Ballenger), and “BEAUTIES FOR THE NAZI ARTIST OF AGONY”; historically interesting exposes like “WHY I HATE SOCIETY: A HOMOSEXUAL SPEAKS OUT” and “THE DISGRACE OF A FEMALE DYPSO”; classic “cheesecake” photos of Penelope Martin and Claire Shaw; interior artwork by Bill Wenzel, George Alvara and Norman Saunders – plus, gonzo vintage ads and more!